There are a staggering amount of images created every single day by millions of people, all around the World. Millions upon millions of captures depicting events, activities, things, people, places, ups, downs, insides, outsides, fronts, backs, highs, lows, happy, sad, young and old. I have no official data to back this up but I imagine a good 99% of those images aren’t seen by anyone. There are many reasons for why an image never makes it to feel the gaze of an audience upon it but there’s perhaps one that will stop an image dead in it’s tracks; it’s just not good enough. Harsh, but true, most images are bland, poorly taken and have now real meaning. That isn’t a reflection on the people who take them because most photographers don’t intend their imagery to be anything other than a personal record of something they wanted to capture and remember. That leaves us with the 1% that do make it out in to the World for all to see, most of which will receive little attention, but a few, they'll make it on to a page, or a book cover or a gallery wall. Some will become iconic and remembered forever. Why is that? What makes a successful photograph? What separates the mundane from the magnificent, the rubbish from the retweeted? Anyone who has elevated their interest in photography above the need to only capture something for the sake of memory will almost certainly have asked themselves why one image can gain much attention and another is forever devoid of interest. It’s natural to want to identify that secret formula that ‘must’ exist bestowing greatness upon the images of those who know how to concoct the ingredients of that elixir of greatness. Despite the billions of images, there are only what amounts to a handful that are memorable, so if we freeze reality for a few minutes and imagine that secret formula did exist, what might it look like? After much gnashing of teeth and laying awake at 2:00am thinking about this I have come up with a possible, maybe, it could be, answer. Possibly, just possibly, it would look like this; a teaspoon of technique, 2ml of aesthetic and a sprinkle of interest and when you mix that up you make something delicious. Let’s break down those ingredients and see how they contribute to the cake of success. There was a time when learning the technical side was a very important stepping stone on the photographer’s journey to taking a decent image. 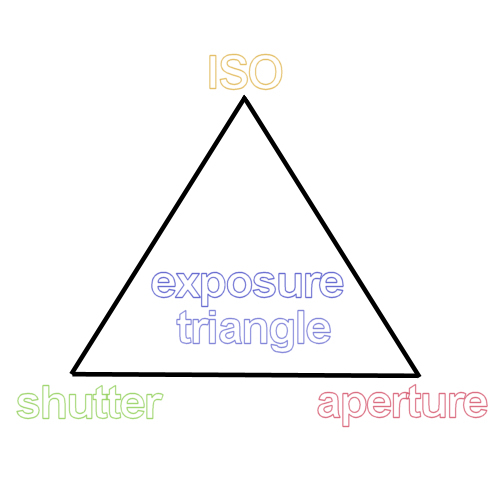 Learning the exposure triangle of the shutter, aperture and ISO, how to achieve sharpness, understanding light and along with a lot of other things, prepared the newbie for the image-capture journey ahead. This knowledge meant that almost any scene could find it’s way to being recorded successfully, that is, in focus and correctly exposed, in to a photograph. Today a serious photographer will likely understand how the shutter works with the aperture and ISO and understand that manipulating these together allows for different effects and scenarios to be recorded. However it’s also possible to call oneself a photographer and yet, know nothing of how they work together, leaving it instead to technology to work it out for them. Even though that little triangle of knowledge remains a mystery to our photographer, they would still need to understand how to achieve a decent capture on their device, even if that’s just selecting the program that does do it all, that green P eh? Then, pressing the shutter button at just the right time. Technology hasn’t quite got to the point of knowing what to point the camera at and when to click. Not yet anyway. It’s interesting to note that the technical doesn’t always have to be right to make a great image. Henri Cartier-Bresson once said that ‘Sharpness is a bourgeois concept’. Make of that what you will but it’s not hard to find great images that actually aren’t sharp and yet lose nothing of their power because of it. Check out some of Robert Capa’s famous D-Day landing images to see why blurred can actually add to the power of an image. See Robert Capa's D-Day images here. So the technical can be very technical and require the understanding of how to capture light in through a lens or it can be just knowing where the button is that opens the camera and lets in the light but the more a creative knows about the technical, when and how to use it, the better the chance of getting it right. It’s fair to say that our technical ingredient has solid science behind it. The facts are black and white, whether you understand them or not, if it’s you or your camera making the decisions, it’s still setting a shutter speed, picking an aperture and ISO to work together. Aesthetic has no such scientific background. The look of an image can of course be created from those technical settings but equally an aesthetic can be applied on the computer, adding mood, texture, bringing out or hiding detail, increasing or removing colour or using a look that emulates photography from it’s many different eras. This ‘look’ appeals to the senses, to that part of our brain that likes to see nice things because it makes us happy. There are a mass of images that have that appeal but if we were to pick a few photographers who have created images with a captivating look, how about Alec Soth, Annie Leibovitz, Nick Knight or Nadav Kander? Their work could be manipulated in many different ways but they have applied a signature style that makes their imagery recognisable. The aesthetic ingredient is very hard to define but when it’s seen, you know. Perhaps it helps to look at a lot of work to get a feel for the infinitely different styles there are out there to get a bit of a grip on this elusive aesthetic quality. Much like aesthetic, Interest is a wooly thing to write about. There are no hard and fast rules, just something in the image that appeals to us. It could be a nice smile, a beautiful landscape, a footballer celebrating a goal, almost anything that stimulates an emotional response in our minds. It’s not just the appeal of a nice scene though, images can offer a cerebral challenge that we can’t explain but we find appealing nonetheless. For instance, taking one of the photographers from the list above, Alec Soth, his ‘Niagra’ series features an image of a car parked outside what looks like a motel. (Warning: Contains adult content). This is a very bland landscape but it is part of a bigger project, so it contributes to our understanding of the meaning of the work. He takes photographs of everyday scenes and the people who are in some way involved in those scenes. Each image stands up on it’s own as having interest but that increases when it’s added together with the other photographs from the project. The hard part is identifying what’s interesting enough to photograph and this is where the successful photographers who understand this rise above those who can’t. Photographers wanting to learn about creating images of interest should study the work of those who make photography the World wants to see. 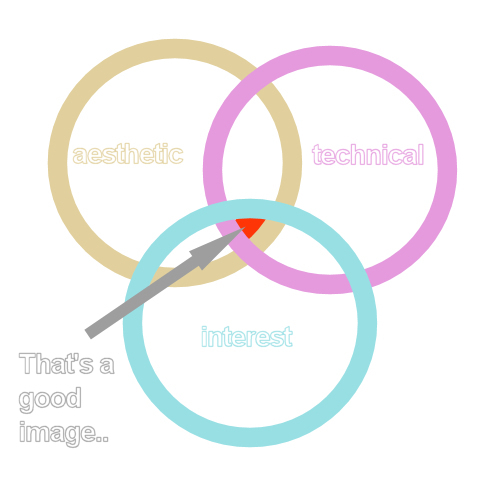 Ask why are those images interesting? What's the story, what's the human interest, what's the nature interest? Why does their work feature on the front of the magazines or their photo stories become critically acclaimed books? Of the three ingredients, Interest is the most important. It's the only one that can potentially make up almost 100% of the mix. If there's enough interest, then a successful image can contain only the smallest drop of technical and no aesthetic at all. If you were to lavish an image with aesthetic to the max, poor content would always mean a poor image no matter how good it looked. To use a very old phrase, 'you can't make a silk purse out of a pig's ear'. When you put all the ingredients together, out pops the photograph. If it’s a good one depends entirely on how good the photographer was at mixing our three ingredients. But who decides if that cake is any good? The photographer has to make a decision first. Do they have enough faith in their work to share it for others to see and possibly pass judgement? If not then it’s never seen and the photographer will never experience success because they didn’t take a risk and put it out there. If they did, they could be exposed to ridicule because the mix is totally wrong. Maybe though, they actually got it right and the work is warmly received. Perhaps, because the photographer took the risk to share, their work is bought to the attention of the people who matter, the editors, the curators, the buyers. They see the work has interest and they wish to use it in a magazine or put it on a wall in a gallery to sell. They see something they like in the work and it gains traction and popularity. It’s shared on the social media sites and shared again because people like what they see. It gains that most desirable of states, viral. Of course bad pictures go viral too, but they go viral because there’s something in them that has interest, good or bad. Successful photographers can sense 'interest', have a technical understanding to turn their creative vision in to imagery and know how to work with their look for that signature aesthetic. Once a photographer’s work is known in enough circles it becomes more valuable because of their ability to make images that appeal to the viewer’s emotions and senses. Not all images that become successful are from known photographers. Sometimes an unknown photographer captures a scene defining a moment which resonates with many people who are captivated by that split second in the frame. World-wide fame is bestowed upon the image and sometimes the person who took it. It takes a photographer, amateur or professional, to be in the right place at the right time, using their technical ability and pointing their capture tool (because it could easily be a phone or a camera) at an interesting scene. The name of the photographer will also influence the success of an image. If we consider the work of Andy Warhol, (not specifically a photographer, but a creative all the same), he used tins of Campbell's soup as a subject for some of his most famous work. There can't be anything more mundane than a grocery item to make in to a piece of art but its success must surely be because of who made it. It might be interesting to consider the life-story of the photographer as another ingredient because all of that will have some bearing on what they decide to point a lens at. Our experiences shape our outlook, vision and what’s important to us as people. Maybe you disagree with our take on what makes a successful photograph. Is there something other than technique, aesthetic and interest that makes a difference? There are certainly no rights or wrongs and if it were as easy as using a formula then the world would be awash with amazing imagery. It's a debate that will no doubt last for as long as photography exists and long may the mystery of success continue. To quote Ansel Adams, ‘You don't take a photograph, you make it’ so it's safe to say our three ingredients are just the start.